Kia has announced plans to offer a Soul EV in the United States. Set to go on sale next year, the Soul EV is described as a "natural extension of the Soul's urban-friendly place in the brand's lineup of award-winning vehicles." The company declined to release additional information but said we can expect to learn more at an upcoming auto show. While Kia is remaining mum on details, our spies have already caught the model undergoing testing. 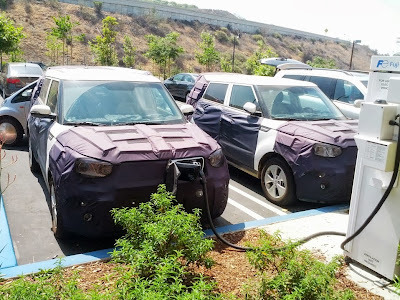 Despite being heavily camouflaged, the photos revealed the model will have a revised grille with an integrated charging port. Little else is known about the model but previous reports have indicated it could accelerate from 0-100 km/h in less than 12 seconds, have a top speed of 140 km/h (87 mph) and travel up to 200 km (124 miles) on a single charge.